All content on this website is copyrighted, authentic and owned by MacTouchBarApps and cannot be used without expressed written permission from MacTouchBarApps. The most epic trick Microsoft used to introduce mouse controls, as we know now, was offering free solitaires in Windows. Being older than computers and more popular than Windows, solitaires are a granted success. 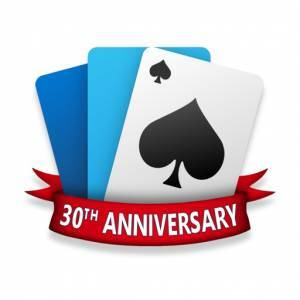 Now Microsoft Solitaire Collection can be played on Apple mobile devices too. There’s not much one expects from card games. The background is quite plain, a step away from being dull, but it does its job of not interfering with the cards. These look quite classical, recognizable and new. To add some variety, Microsoft offers more card designs. The default one is decent, but if you wish, you can additionally download more free designs, including Wild West style, Fable yellowed from time, surfing and salty Beach style, Jumbo design for those visually impaired, and more. Card backs are also selectable, with a set of free options. There are different versions for iPhone and iPad, the former being compact and dense, and the latter utilizing larger screen space much better. Both are equally comfortable to play, minding the overall device ergonomics. Tapping and dragging are the two foundation stones of card games on a touchscreen. It works just the same way it did in first Windows editions, motivating you to click and drag cards with a mouse. Now you do the same with your finger upon the screen. The classical mechanics remain intact even in a digital representation. So if you have played them with real cards, you’ll get used to it in an instant. The menu may seem a bit too complicated, but it mostly contains optional elements. Options for any particular game pop up as you start it, so you can select difficulty level for any game without opening Settings. If you remember Windows versions introduced to teach early users to handle mouse (as we know now), you’ll be delighted to see familiar Klondike, Freecell, and Spider, as well as introduced later Pyramid and TriPeaks. Each of them is accompanied with a brief tutorial explaining how to play it (in case you never encountered them before). If you don’t need these reminders, just tick a box not to show them anymore. Each of these solitaires features a set of decks defining its complexity. Level of difficulty can be selected as you start a new game. Success is not granted in most of these solitaires, though some claim that any Spider layout has a solution. Your stat can be stored in your Microsoft account if you bother to log in. But it’s not that necessary just to play. It was not an accident that Microsoft introduced classic solitaires that have been popular long before computers. Their appeal is proven by centuries. But it depends on how much you play. Simply playing these solitaires may be a bit dull, so Microsoft offers daily challenges, special events and other secondary entertainment motivating you to play more. Microsoft Solitaire Collection is a classical casual card game for one player. The app may be too stuffed with ads, but that’s the reason we have it for free. There are rival solitaire collections with more games and more elaborate design, but if you just want something to kill minutes, this one is the perfect option. There are larger and more stylish solitaire apps.